It’s astonishing how quickly the room-filling computers of the 1950s have evolved into today’s smart, portable, electronic devices. Computer technology has become increasingly essential, and while electronic products have rapidly decreased in size, they have increased in processing power. Now fluctuating economic and meteorological information from all over the world can be collected, formatted, and made instantly available to anyone owning these affordable devices. This rapid accessibility to information is here for keeps and is constantly improving. Even as electronic equipment has become tinier, it has also become more interactive. The motion-sensing technology in Microsoft Kinect and Nintendo Wii video-game consoles, which responds to movement and shares that information over networks, has been hacked by artists who wish to transform data into interactive environments and complex three-dimensional models. Artists are able to use this technology to create new computer interface possibilities and to capture and visualize data. 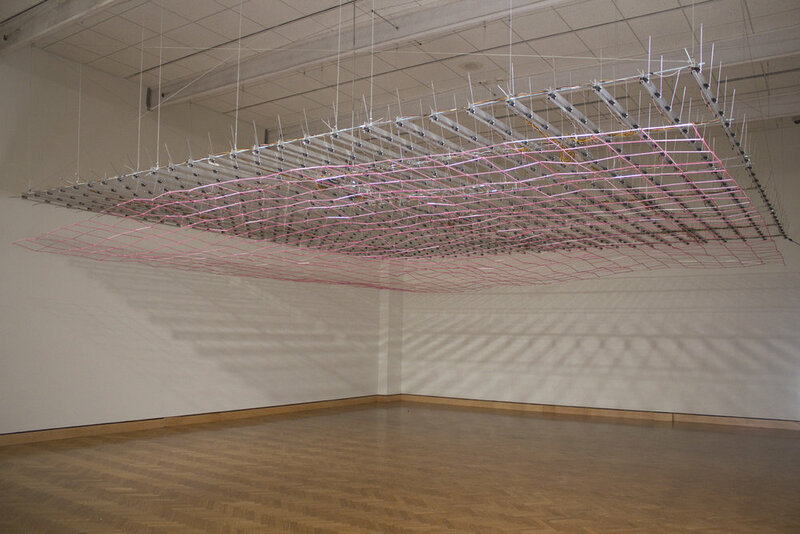 The suspended grid structure of David Bowen’s Minnesota Artists Exhibition Program installation underwater responds to digitized data from lake waves, which he collected near his studio in Duluth, Minnesota. 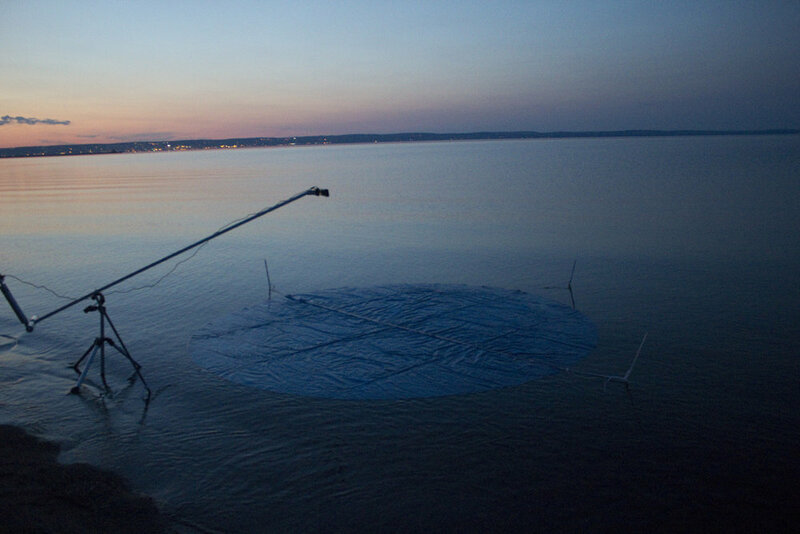 Bowen used a Microsoft Kinect’s camera to capture and record the surface movement from a section of Lake Superior. 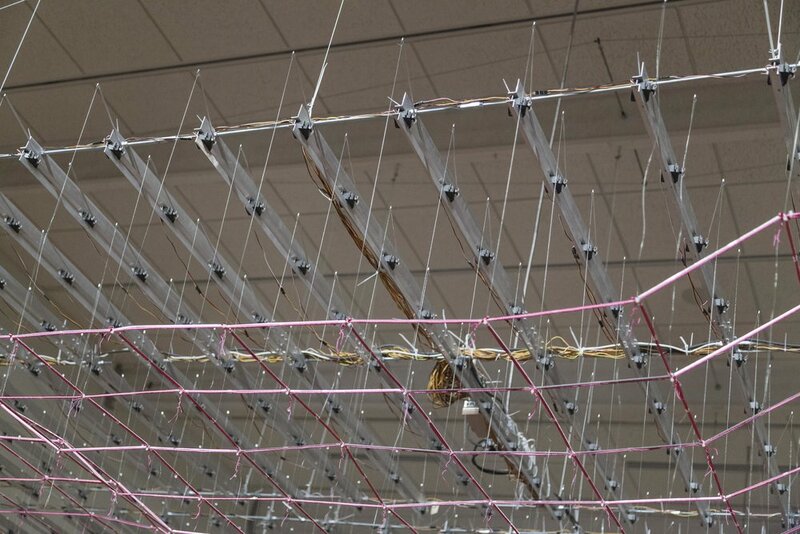 This infrared array of data points created a three-dimensional model called a “point cloud,” which was saved and transmitted to the suspended grid. By outputting the point cloud, underwater creates the reverse movement of the waves. Standing underneath the structure and looking into the gently undulating aluminum-and-wire scaffolding, visitors can experience the underside of the raw data from the lake. A fascinating slippage of time and space happens to the visitor; standing underneath underwater is like looking up through waves that were recorded months ago and hundreds of miles away. Bowen was working with rapid prototype printers and infrared sensors years before these powerful modeling and motion-sensing technologies were commercially available. He has even used the National Oceanic and Atmospheric Administration’s network of buoys to stream live wave data into his installations. In these early pieces, Bowen created tightly controlled systems that limned the formal connections between nature and technology. The hi-tech components of growth rendering device (2007) and swarm (2008) were always in contact with, and in some cases controlled by, plants and animals. When they were set in motion, the artist got out of the way so the systems could function unassisted. Movement was converted into mark making and the forces of wind, growth, and waves were made beautifully visible. But the system gradually broke down when the plants or insects died. This relationship between natural movement and technology, between life and death, is key to Bowen’s art. Like other complex systems, underwater is made from hundreds of moving parts and bits of stored data collected from nature. These tightly organized relationships among component parts are crucial to Bowen’s work. But within the strict synchronicity of these moving parts, the range and motion of the work still has limits. Watching underwater for a few minutes allows a viewer to experience a hypnotizing effect. There is a limited range of motion for the suspended lattice; any single piece of it will go only so high or so low. Underwater is a waveform that is nevertheless consistently changing. That is, within the limits of the installation’s range of movement, it is impossible to predict what will happen next. This creates the effect of an infinitely dynamic range of controlled behavior. Since the wave functions on a constant stream of data instead of a master-plan algorithm, it could be said that underwater behaves with a kind of autonomy. The device’s scaffolding and gently undulating waveforms evoke repetitive muscular movements that respond to nervous stimulations. The exposed motors and circuit components of Bowen’s well-crafted installation eschew hyper-designed tech packaging and maintain a hand-made contraption aesthetic. Bowen doesn’t sheath technology. He keeps the productive wires and purring servomotors on display in clear plastic bubbles or bolted to aluminum frames. So while much of the data and information is transmitted along wires and Internet connections, the output path is laid bare. Bowen was intentional in making underwater’s structure from square shapes. It does the job of being a rigid support. 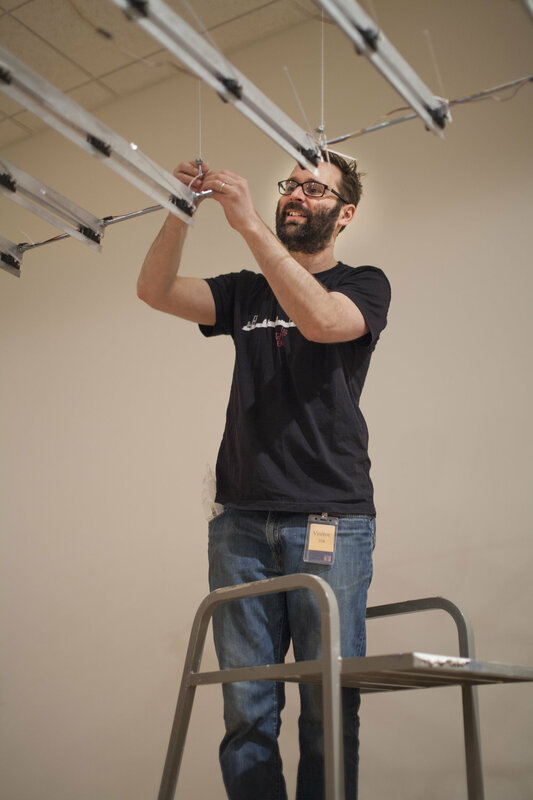 Once the piece is installed and turned on, the data that is output to the motorized arms transform the straight edges of the lattice into a roiling waveform. Underwater has converted rigid geometry into fluid motion. Bowen’s engineered models re-enact natural phenomena in indoor spaces thousands of miles away, but most of the time they fail to repeat the movements exactly. Bowen finds it interesting that the function and form of underwater reflect the dissonance between artifice and nature.